For the past century, New Jersey has been one of America’s most industrialized areas, yet because of its southern-based agricultural activities, bolstered by such familiar names as Campbell’s and Seabrook Farms, it is known as the Garden State. The state is world famous for the Jersey tomato, blueberries, cranberries, asparagus and a variety of other crops. Northern New Jersey, especially Newark, has been better known for processing a variety of food produced. Examples include coffee beans from Brazil that make that rich cup of morning coffee, chicle from Mexico that propels the chewing gum industry, orange juice from Costa Rica and licorice for the candy jar. The story of food in Newark is tied to the many products shipped here from the far corners of the world, then prepared for the marketplace in city warehouses, bakeries, bottling plants or distribution centers. Food has been of concern to Newark and Newarkers since the arrival of the Puritans on the first day in May 1666. One wonders what kinds of snacks the Puritan children relished when they stepped ashore near the site of today’s New Jersey Performing Arts Center. What kind of dinner did the Boudinot family serve to Gen. Lafayette when he visited their home in 1824? What did President Grant eat when he came to Newark to open the 1872 Industrial Exposition? What kind of steak was served to Dutch Shultz before he was murdered at the Palace Steak and Chop House on Park Place in the 1930s? And what was served on opening night at NJPAC on Oct. 18, 1997? Regardless of the answers, food has been of constant concern to us over the years. And much of the time Newark has had a hand in producing it. Founded as a farming town in 1666, Newark was basically a self-sufficient plantation where residents grew much of what they needed. For the most part they relied on the outside world for just a few manufactured products. Mostly, they were trying to shun 17th century associations with outsiders, 'the ungodly.' Only occasionally did they venture outside their theological cocoon. By the 19th century, cattle and hogs were being driven from the West Jersey hills to Newark and Jersey City slaughterhouses. Once the rail link west was completed in the 1830s, it became obvious that it was cheaper to bring cattle from Kansas City by train. Although Newark and Jersey City were the centers for the new meat industry, Jersey City eventually won out, partly because of its location on the railhead, and partly because of its proximity to the nation’s largest city across the Hudson River. Another early industry that prospered in Newark was the milling of flour. The Newark Daily Advertiser announced on January 25, 1866: “We learn that is in contemplation by certain parties to erect an extensive Steam Flouring Mill in this city during the coming season. The mill be will be located at Commercial Dock, and the building will have a river front of 100 feet, with a depth of 400 feet and a frontage of 200 feet on the Morris Canal. It will be nine or 10 stories high and have a 16 run of stone, capable of turning out 1,500 barrels of flour a day. The building will be so constructed that the capacity may be doubled at any time. It is calculated that the mill will absorb 7,500 bushels of wheat daily. The enterprise will be under the direction of Mr. Lewis Fagin, who has been a long time connected with the manufacture of flour in Cincinnati, and it is intended to open a warehouse in New York as soon as the mill here gets into operation.' While the flour industry was off to a great start and its development seemed natural for expansion, it was too late. The great flour mills of the Midwest already had assisted that region’s undisputed title of queen of the American flour industry. Nevertheless, Newark established its own niche by taking a commanding position in the development of bakeries. This created a great demand for the flour produced by the Midwestern millers. 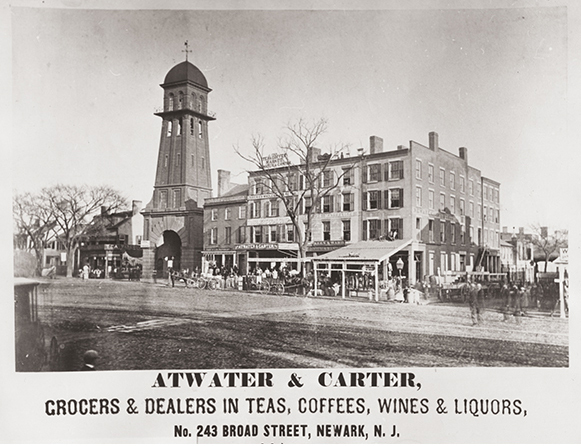 The availability of good water has spelled success for Newark from its very beginning. It brought the first settlers here by way of Newark Bay and the Passaic River and was available for drinking from wells and from the river that was then unpolluted and that doubled as early highway. Water from the river did not become unsuitable for drinking until the beginning of the 20th century. The development of fresh water reserves and purchase of water from distant reservoirs not only improved the average person’s changes of survival, but was a godsend also for the local brewers who demanded a pristine supply for their products. Even today, fresh water is a must for industries such as the $100 million Coca-Cola bottling and distribution center, which is to open in Newark next year. In 1894, the Newark Milk and Cream Co., which became the Alderney Dairy Co., was founded at Bridge Street between Broad Street and McCarter Highway. By the mid-1930s, Alderney has become one of the most modern milk plants in the country. Its three-story building was equipped with the best pasteurizing and bottling equipment. Glass-lined delivery trucks brought milk from 800 dairies to the Newark plant. By 1936, the company controlled 10 large creameries and had other plants in Asbury Park and Hackensack and Orange and offices in Montclair, Elizabeth and Plainfield. In the Newark headquarters building, now the construction site for the Newark Bears stadium, arose the huge Alderney Dairy Sign—a giant milk bottle that was considered one of Newark’s most famous business landmarks of the 1930s. Orange juice also is a product of Newark, made from 'raw materials' from Florida, Brazil, Mexico, Costa Rica, Beliz and Honduras. Regularly, the tanker Uchoa brings 1.3 million gallons of concentrated juice from Brazil. A sister tanker, the Bebedouro, deposits 2.2 million gallons at Cargill-Citro-American terminal at the port. This is one of the reasons that Latin American growers refer to the metropolitan region as the 'Citrus Bowl' of the nation. It takes approximately 1 million trees to fill a ship, and 21 days for the cargo to arrive at the port. Brazilian and Florida juice actually complement each other since they have different growing seasons. Upon arrival in Newark, the juice is stored in 16 stainless steel tanks standing six stories high and are surrounded by a blanket of nitrogen for preservation of the concentrate. Pure orange juice is not transported because of the cost. From the opening of Newark’s fresh water supply in the 1800s, the city has been a beer-producing center. At first, small German breweries held their own in the marketplace. Later, the industry’s giants took over, ensuring Newark’s title as the beer-producing capital of the East. Remember Ballantine, Hensler, Krueger, Feigenspan, Weidenmayer, Pabst and the only survivor—Anheuser-Busch? In 1990, Anheuser-Bush produced 50 million barrels of beer nationwide. By 1995, Anheuser-Bush was using more than $2.2 million worth of Newark water to make its product—a pretty good recommendation for Newark water and former Mayor Haynes, who dared to develop the watershed over the protests of contemporaries who referred to the project as Hayne’s Folly. If you wanted something other than orange juice or beer to quench your thirst in the 1930s, the Hoffman Beverage Co. might come to mind. The 10 acres of immaculate white buildings that housed the company in the Vailsburg section of the city used Newark’s pure water supply to mix its carbonated drinks. In 1918, the company began making ginger ale, celery tonic, sarsaparilla, root beer, cherry, lemon and cream soda. It developed fruit flavors of orange and raspberry. It extracted flavors from buds and flowers, cloves and exotic fruits. It used seeds of paradise, roots and stems for sage and peppermint, and bark for wild cherry and cinnamon. Cleopatra is thought to have produced the first tonic by dissolving a pearl in a cup of wine. Hoffman brought the idea home to the neighborhood kid on the sand lot who enjoyed his time-out with a cold soda. Newark was a town of bread and butter. At Raymond Boulevard, M. Augenblick and Brother stamped out rich, creamy butter in one-pound boxes and became one of the area’s largest processors of sweet cream butter. Founded by Meyer Augenblick on Commerce Street in 1899, the company bought out Cooper and Brower in 1908 and Drost and Snyder of Commerce Street in 1920. In 1930, the firm moved to 1065 Raymond Blvd. near Pennsylvania Station. Its home resembled a banking institution in its cleanliness. Its three-story white walls were of pure white tile. Golden brown tiles decorated the interior. General Distributors acquired the business in 1928. The following year it was sold to the Borden Co. At its peak, the business sold butter, poultry, cheese and eggs. Twelve trucks from Newark and five from Paterson circulated produce to 125 New Jersey communities, from Point Pleasant to the New York state line. Dugan Brothers Bakeries began in Brooklyn in 1878 as a small vegetable-and-fruit store, selling 100-percent whole wheat bread. After a disastrous fire, only a portion of the original building remained. A three-block long facility soon was opened in Newark in 1923, along Third Street facing Branch Brook Park. It remained until 1953, when it was closed. In its heyday, Dugan’s had 5,000 plus employees and produced 5,000 loafs of bread daily. Hundreds of deliveries were made all over North Jersey, first by horse and later by truck. In 1934, the A&P Bakery on Queen Street opened and began producing 4,000 loaves of bread a day by keeping the ovens going nonstop. Two huge ovens, each 95 feet long, baked the bread. More than 200 men and women ran the operation. The rear of the bakery faced the Waverly Yards near the Anheuser-Bush plant. Meat products of all sorts also were part of the Newark food list, which also included frankfurters, hams, sausages and smoked fish. At one time, Swift and Co. worked to develop a better frank by dipping the meat into fresh pineapple juice. The company’s scientists also experimented with all kinds of meat processing procedures, including a search for a better peanut butter. For many years, Van Wagenen and Schickhaus Co. was based at 30 Plane St., now University Avenue. After 52 years in business, it moved to Harrison. In the 1940s, Newark was a popular spot for curing smoked fish. Most fresh-water fish came from the Great Lakes, with the exception of butterfish that were caught off the New Jersey coast. Sixty thousand pounds of fresh butterfish was processed in Newark in 1943. Salmon arrived in huge wooden casks weighing 800 pounds each. Packed in brine, the salmon were washed and dried, then hung in the smokehouse. Before starting your next meal you might want an hors d’oeuvres. Years ago the place to go was Cohen’s Famous Foods, founded in the 1940s by Sidney and Ed Cohen. When it later merged with a Chicago subsidiary, the business became one of the nation’s largest pre-dinner outlets. Originally, knishes for the Jewish community were made in a small shop on Hawthorne Avenue. In 1950, the firm moved to a new plant on Frelinghuysen Avenue, where it expanded by catering to hotel chains, country clubs and supermarkets. Sixty residents were employed there. Let’s not leave dessert out of our Newark food pantry. More than 60 years ago, bananas were imported to Newark warehouses for final ripening. Maturing the fruit was accomplished through an elaborate process achieved by heating and cooling. From the time the first bananas were imported from Cuba in 1904 until the present, the banana business has been big in Newark. Since 1916 the ripening process has been a staple at Port Newark. Another sweet treat from Newark is Mrs. Wagner’s Pies. Each day Newark-based pastries were shipped as far south as Philadelphia and as far north as Glen Falls, N.Y. Of all the varieties of pies, apple was the favorite. Others included mince at Christmas, egg white during summer and cherry in the spring. In 1932, Mrs. Wagner’s introduced a square pie for the blue- collar worker’s lunch box. Ice cream making started in Newark as early as the 1860s and eventually grew into a major operation. Breyer’s started making its product in the Kensington section of Philadelphia. Its Newark plants eventually employed more than 200 workers and turned out more than 75,000 quarts of ice cream daily. In addition to ice cream, fancy ices and desserts in the shapes of animals were produced. For years, the famous Breyer’s sign was another Newark landmark, easily seen from all over the Ironbound. In 1904, William W. Klob made his reputations as the first to offer red candied apples in this country—possibly the world. His experiment with red cinnamon candy caught on. Originally, he set up his business in the Roseville section of the city. Later, he moved to Broad Street, where he perfected the all-day-sucker. Other candy was made at the Hooten Chocolate Factory, founded in 1897. The company moved to Newark in 1904 and expanded several times over the years. It now is one of three W.R. Grace plants. To strengthen its competitive position in the bulk cocoa business, Grace undertook a $3.2 million expansion in 1982 and 1984. If you decide you need a stick of gum when leaving the dining table, well that, too, was made here. A Mt. Pleasant Avenue company presided over by D. Shaeffer in 1943 provided a variety of gum. A sugar-based flavoring produced a doughshaped into balls and spun into sticks of gum through a system of pulleys running from floor to ceiling. Several private brands also were available for the Newark market. From soup to nuts, hors d’oeuvres to desserts, plain to fancy foods, earliest times to the present, Newark has been a favorable place to get something to eat.